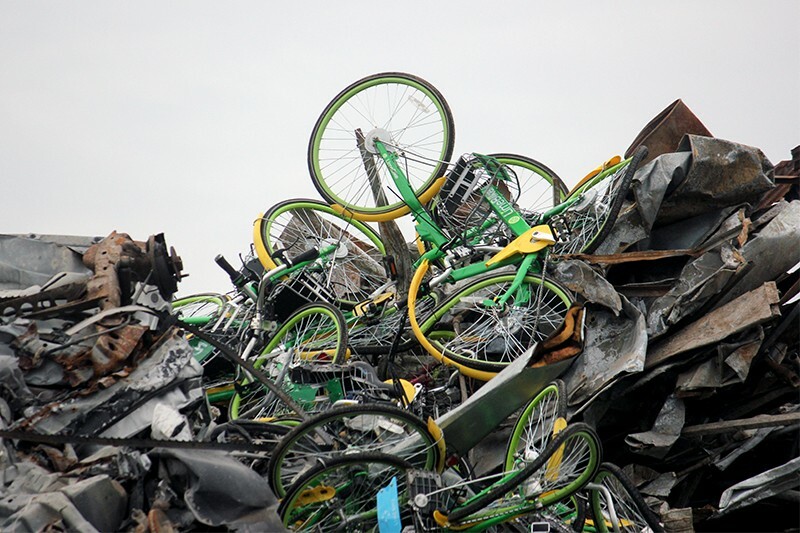 Lime bikes turned up at a St. Louis scrapyard on Wednesday, dumped by the dozens on a mountain of junk that overlooks the nearby riverfront biking trail. 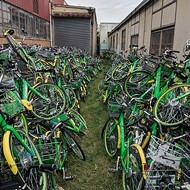 This scene of trashed Lime bikes — a situation not uncommon in other cities — follows the company's announcement earlier this month that it is restructuring its St. Louis fleet by completely removing its stock of bicycles. In their place, the company said it would increase the availability of its popular (and more expensive) scooters. 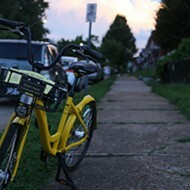 But unlike rival bike-sharing company Ofo, which pulled out of St. Louis in July, it's not clear whether the company attempted to donate parts of its bicycle fleet, which at one point numbered 1,500. The bicycles' presence in a north city scrapyard suggests it did not. That's sad news for Patrick Van Der Tuin, executive director of the St. Louis BWorks, which works to repair and donate bikes to kids and other non-profits. Over the summer, BWorks had been the recipient of 250 donated Ofo bikes — a relatively small fraction compared to the total number of Ofo bikes apparently scrapped, stolen or otherwise lost to the streets, but still a welcome donation. 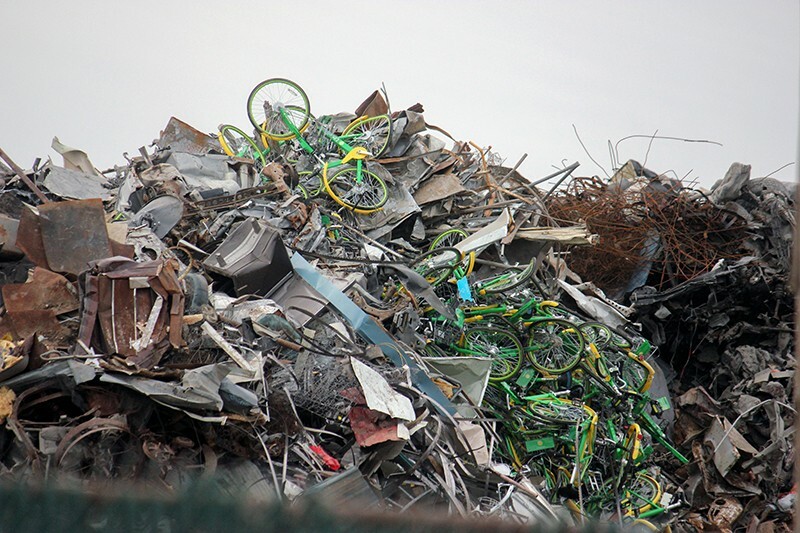 Earlier this week, Van Der Tuin says he began hearing about scrap trucks from Grossman Iron and Steel making their way across town carrying piles of Lime bikes. Investigating further, on Wednesday he visited the warehouse in Dogtown where Lime previously stored bikes awaiting repairs. There, Van Der Tuin found a Grossman truck being loaded with Lime bikes. He noticed that bikes' bodies had already been cut in half to remove the batteries before their trip to the scrapyard. Van Der Tuin tweeted out his findings, posting photos of the truck and a bisected bicycle. In the tweet, he wrote, "Even with multiple notices that this was going to happen that no one from Lime or the City of St. Louis could manage to get a plan together that would have salvaged these bikes." In an interview later that afternoon, Van Der Tuin says that he previously attempted to contact both Lime and various city aldermen, but no one could tell him if there were plans to reuse or donate the bikes. 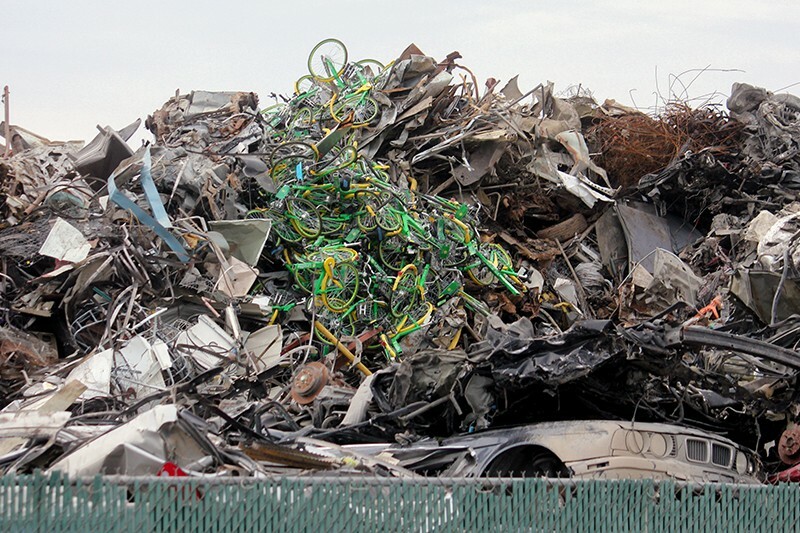 To Van Der Tuin, it appeared that Lime was choosing to the easiest method of disposal for the bikes — a method that required slicing hundreds of bicycles in half. In October, the warehouse where Van Der Tuin spotted the Grossman truck was home to hundreds of Lime bikes awaiting repairs. 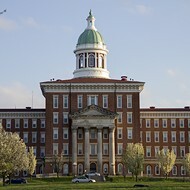 At the time, a company spokesperson stated that bikes were being fixed and would return to service in a matter of weeks. 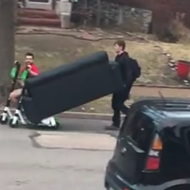 Instead, earlier this month, the company announced it was pivoting to scooters. And when RFT visited the warehouse Wednesday afternoon, all those bikes were gone. "We know of at least three Grossman trucks, 60 feet long, that are filled with these bikes," Van Der Tuin says. "Maybe some of them went somewhere else, but it seemed like like the bulk of them went to the scrap yard." Van Der Tuin says the company's actions aren't just inexplicable, but a backtrack of the promises Lime made when its fleet launched in April. "This whole project was sold to the bicycle community as, 'We're going to get more cyclists out here, and more cyclists are going to make everybody safer,'" he says. "It was going to be this big, environmental, green transportation mode." Instead, the bicycles have created more waste. 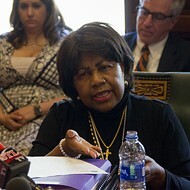 And while it may make business sense for Lime to accommodate the apparent consumer preference for scooters over bikes, those scooters are so accident-prone that local doctors have called on city officials to convene a task force in order stem the tide of emergency room trips. Also, scooters are more expensive than Lime's discontinued bikes, which had cost just $1 per half-hour. Now, riders will pay $1 just to unlock the scooter, and then fifteen cents a minute onward. 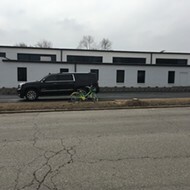 For cyclists like Van Der Tuin, the end of Lime's bike operation is a deep disappointment, and a waste of an opportunity bring sustainable transportation at a vast scale to St. Louis. "This whole project," he says, "has turned into anything but more cyclists or being environmentally friendly." 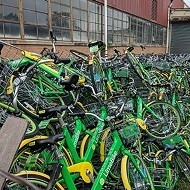 In an email this morning, a Lime spokesman emphasized that the bikes that wound up at Grossman are being recycled, not consigned to a landfill. Recycling a Lime bike requires batteries to be removed — and that means taking apart the bikes. Donating the bikes, however, isn't in Lime's plans. The company says that bikes already in working condition are heading to other cities. Gifting bikes that need major repairs to a nonprofit, the company said, would be unfair to the recipient.